If you're one of those people who's been building a giant rubber-band ball for the last 10 years, you've probably already got yourself a nice ottoman to go with the Tag'Liatelli. Described as either a seat or a piece of sculpture, the Tag looks like it's made of really big rubber-bands, although they're really pieces of QM foam. 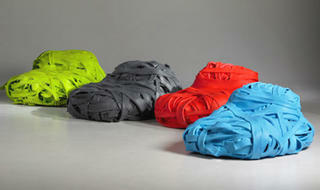 Each one is hand made by designer Arne Quinze, and you can get them in 24 Pantone colors. At $3,795 apiece, buying one of each color would run just $91,080. But think of the epic rubber-band fights you could have with 23 of your best friends. does anybody know if there are cheaper versions of this awesome chair?! ?